One of the most popular beaches in Bali, Virgin Beach is a place to set off to when one wishes to get the best of the city. Every corner of it bespeaks fun and joviality. 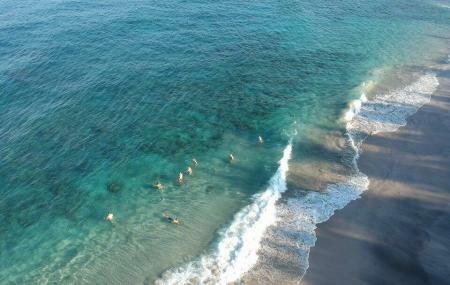 The beach offers a wide range of activities including boating, snorkelling, swimming, surfing and such. Walk around the beach feeling the sands underneath your feet or enjoy a nice sunbath, you can get it all here. The sands are super fine and smooth and are complemented by the azures of the water. The view of the bay is simply so stunning that you will find yourself clicking more pictures than you expected. Once done with everything, you can stop by in one of the many restaurants and spend some quiet moments having your meal. Hotels like The Peacock Inn, Alas Petulu Cottages and Batu Empug Ubud will solve your problem of where to stay in Bali. Curated Bali vacation packages await! Book the best ones and start turning your dream into reality.Discover various ways for how to reach Bali and complete the booking by choosing your mode of transport. Wear a lot of sunscreen and bring a lot of water. How popular is Virgin Beach? People normally club together Ujung Water Palace and Bukit Jambul while planning their visit to Virgin Beach.